The Modular Kitchens becomes more sophisticated by the advancements in design and technologies. These sophisticated design and quality of materials results in an efficient and enjoyable experience of cooking. This adds a touch of elegance to the house as well. Every family passes down the traditional recipes and spice mixes every generation. But the kitchen equipments are passed down to only one generation or two because of wear and tear of these equipments over extended usage. This is one of the reason for people to invest in modern designs for the kitchens and the equipments. No matter how clean the kitchen is when it is new. But then, it is inevitable that the kitchen will get dirty over time due to spills etc. If it is not properly cleaned or maintained, it will invite a lot of pests, bacterias and other harmful germs. Apart from the hygiene factors, it also leaves a bad impression in the visitors. Hence, It is vital to keep the kitchen clean. The following are the tips to maintain a clean modular kitchens. Regular Cleaning is a must. Clean the appliances with a wet cloth and mineral oil. Keep the floor and walls clean by scrubbing thoroughly. For better results, using disinfectant sprays and clean cloth for the sleek surfaces like countertops. The steel modular kitchen and steel sinks can be cleaned with soft nylon pads to avoid the surfaces being scratched. If the sinks are ceramic, then it can be scrubbed with vinegar. Before placing the dishes in the dishwasher, giving it a light rinse will ensure the removal of all traces of food crumbs and oil. Using cleaning liquid directly on tough stains on the appliances to get better results. Wiping the stove and burners frequently, to avoid the clogging of food particles. The refrigerator should be cleaned frequently and clean the shelves with warm soap water like once in every week. The old dishes and rotten vegetables that are stored in the refrigerators should be frequently disposed of. The cabinets should be cleaned frequently. The accidental spills leave bad stains on them and we often forget about cleaning the cabinets since they are closed. 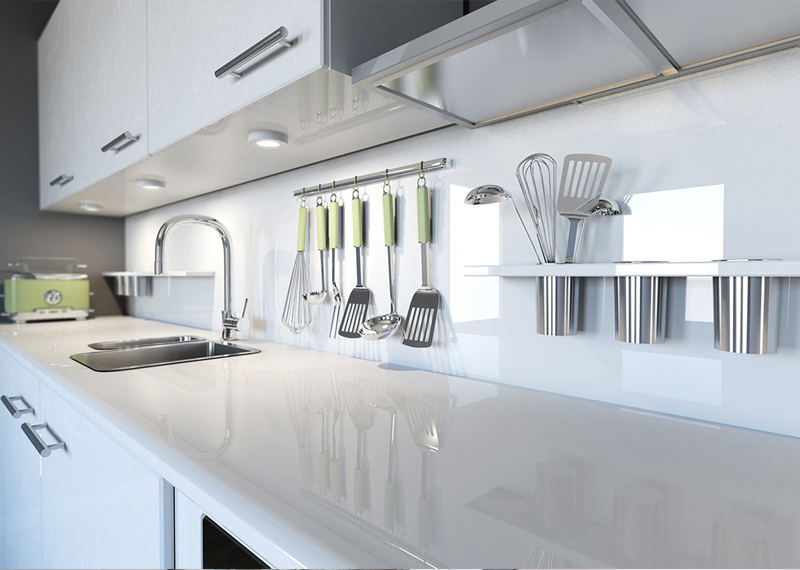 This doesn't just ensure the hygiene of the kitchen but also elevates the clean look of the kitchen. The chimney has to be cleaned twice in a year with a heavy duty vacuum cleaner. Regular washing of kitchen rags and rugs should be ensured. It is imperative to keep the kitchen clean and maintain it properly. For an efficient and enjoyable experience of cooking, .contact Sekhar & Co, who is an exclusive dealer of godrej interio, right away.